SPX - (3-5 Days)- Bullish, using 2785-9 as a stop for longs- Expecting 2860 should be challenged and exceeded this week before any top, as time remains a bit early for a top. Yesterday's late-day rally into the close helped US indices fail to breakdown sufficiently to think that market are peaking out right away and corrections for now still look a bit early. However, the reversals in Technology did look somewhat damaging, particularly in Semiconductor issues, and momentum continues to worsen. Overall, its likely that upside at this point proves limited and that rallies into next week should be used to sell for a more serious pullback in the month of April. Bottom line,one should still stay positive barring a move down under 2789 for Futures, 2785 for SPX cash. 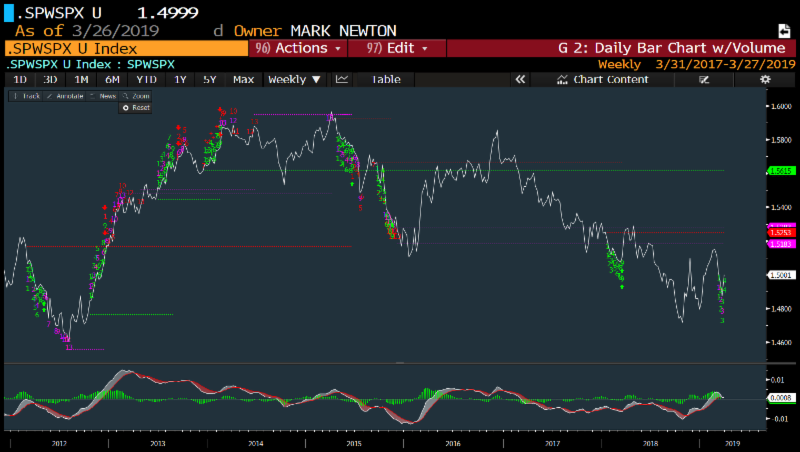 Demark exhaustion is not yet complete, and there stands to reason that a rally into end of month/quarter could happen given how positive the first 3 months of the year have been. With just two more trading days in the month and quarter, SPX is now set to record the largest quarterly gain in 10 years time. However, the extent to which breadth is starting to drop off while Technology has reached resistance looks to be a definite issue heading into the month of April. Failure to rally back nearly right away to challenge and/or exceed recent highs would suggest that any minor rally is a selling opportunity, and that losses are possible in April after 3 straight "up" months. The real concern which many seem to be pointing out now, revolves around the decline in Treasury yields, not just in the US, but globally. We've seen pretty major collapses in yields on most timeframes and with German Bund yields at -8 bps, the demand for US Treasuries at 2.30%+ is very real. Near-term, TNX looks to have a chance at testing this 2.25% which looks to be near-term support. Yet, stocks haven't declined sufficiently to become all that negative. Overall, with regards to equities, t remains right to have a constructive stance unless 2789 is broken. Until that time, it should pay to favor additional stock market rallies into the first week of April. Long FAANG stocks- though with thinking that AMZN and NFLX make more near-term progress than FB and GOOGL. S&Ps pullback hasn't been sufficient enough to think that the trend is yet turning lower. One should obey the recent 2785 spike lows for SPX cash and 2789 for S&P futures that still look quite important in the short-term for this tend. Breaking these levels would add to the likelihood of a larger decline. Thus far, one should still look to buy into recent weakness, given that Jan-March 2019 stands to be one of the best quarters in the last 10 years. The first week in April has some significance cyclically as something which might make a top. For now, too many seem to think that Yields are bearish right away, and this sentiment switch is tough to press the bearish case. SOX decline is thought to be fairly negative in the short run, and while stocks like AAPL have helped Tech hardware show strength even on days like Wednesday, the Semiconductors have turned down sharply which is a bit more negative as a leading indicator for Technology in the weeks/months ahead. While Equal-weighted index underperformance has been thought by many to be a key issue why stocks have begun to stall out a bit, it should pay to see the charts of Equal-weighted S&P vs Cap-weighted SPX which largely has been falling since 2015. So while equal-weighted Sector analysis can often shed some valuable light as to the upcoming directional move in the sector itself, this is a much tougher task with Equal-weighted index study. Note that during the harshest time of Equity declines last Fall, in Nov/December, Equal-weighted SPX was in the process of turning up. Thus, while down over the last 4 years, still difficult to make any immediate conclusion.